More than 25% of the world’s non-spam mail is sent using SparkPost’s technology. That credibility comes in part from our company’s heritage, which is deeply rooted in a decade-long, unparalleled expertise with high-performance email infrastructure. 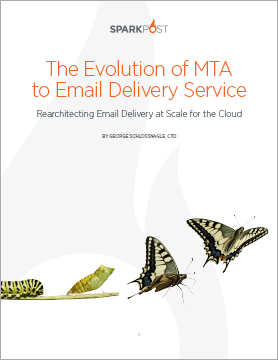 Our team developed the market’s highest-performing email delivery (Mail Transfer Agent, or MTA) software, Momentum and PowerMTA. Today, that email engineering expertise has gone into building the SparkPost email delivery service. But the migration of complex, highly optimized software like MTAs to a service-based delivery model requires more than a just a change in platform. The cloud represents a fundamental transformation in technology architecture. Migrating complex software to the cloud is a challenge for any enterprise. Download this engaging brief to learn best practices and lessons learned today.